Emma Barry is one of my favorite romance writers. And I’m not just saying that because she’s a friend. She’s one of those writers who could write cereal box copy and I’d read it and love it. But add in the romance and politics and Washington, DC settings of the Easy Part series and this West Wing loving election junkie was basically in wonktastic heaven. 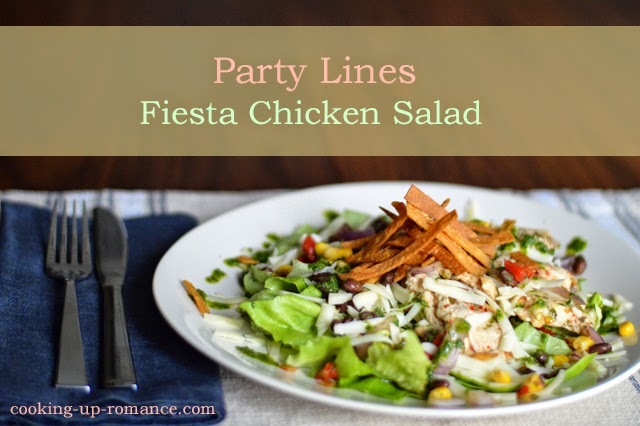 Party Lines is the third book in the series and while it could be read as a stand-alone, it will be richer having read the previous two books as the other two couples make appearances here and take a final curtain call at the end of this book. Party Lines tells the story of two opposing campaign staffers working political campaigns in the run-up to the American Presidential election. Lydia Reales is an ambitious, idealistic Latina who also happens to be a Republican Presidential campaign staffer, a development that plays with both the hero’s and the reader’s expectations. Lydia is just starting out on the national stage and while she has all the makings of a top staffer, she runs into obstacles to being taken seriously as a professional along the way, largely because some of her superiors seem to see her as a token minority brought on board to appeal to the Latino portion of the electorate. She experiences microaggressions throughout the novel, mainly in a professional context, some of which she shrugs off, some of which irritate her. I cringed for her over and over again. It was Lydia, ambitious, competent, aggressive Lydia who really made this book for me. I might not agree with her politics, but I was rooting for her the whole way through. While Michael Picetti is the more seasoned staffer, he has also become jaded in orchestrating run after Presidential run for various sub-par Democratic candidates. Michael assumes that Lydia is naive, in need of a friend and a Democrat like him, all because of her age and her ethnicity. But it’s clear to the reader that there’s some mansplaining going on during their first conversation on an airplane on the way to Iowa. And…well…after that too. He’s an interesting illustration of privilege because he is aware of the issues surrounding sexism, racism and economic inequality. But he’s also an educated white male, which blinds him to certain things. I liked how Barry treated this because it’s both realistic and sensitively handled. I didn’t dislike Michael for it, while still being able to acknowledge that some of his attitudes and utterances are insensitive. When Lydia and Michael clash, which they do, repeatedly, both in and out of the bedroom, it’s pretty explosive. Not only do they disagree on a lot of policy questions, they are at different points in their political careers. Lydia is just reaching the last camp before attempting the summit of American electioneering. Michael has been sitting at the summit for a while and is ready to start back–maybe get out of a position where he has to keep traveling all the time and settle down a bit. So these two have a lot of challenges to work through. We’re kept guessing throughout, not finding out until the very end whether these two are going to be able to make it work long-term. Unlike the first two books (and especially the second book, Private Politics ), Party Lines really does explore ins and outs of American politics. There is a substantial amount of discussion about policy and elections, both between Lydia and Michael and among the various campaign staffers. Despite the fact that some readers may not enjoy the side of politics with their romance, I’m glad Barry didn’t shy away from it. No matter what side of the aisle readers fall on, they will find their views fairly and equitably represented. Barry seems to be reminding us that whether or not we can agree on policy, we are all complicit in the state of our political system. I’m desolate that this is the last book in this tremendous series. I very much enjoyed everything about it–from the focus on work and family and balancing priorities to the measured development of the romances between the characters. While these books have used romance tropes, conventions and language at every step, there’s a realism to them that I don’t commonly see, even in contemporaries. Lydia and Michael and the other heroes and heroines have read like me, like my friends, like the people and situations I’ve come to know living in DC for the last almost 20 years. I’m eager to see what Barry comes up with next. Oh, Applebee’s. How I love to hate you with your 2,000 calorie pseudo-salads large enough to feed a family of four. Though I do understand why Lydia and Michael end up there together, having what might be the strangest accidental first date ever. I did campaign field work for a while, starting with a congressional race and moving onto some issue campaigns. And at the height of campaign season, an hour to eat something that wasn’t Chex Mix, any hour at all, would have left me overcome with relief. Even if it involved eating at Applebee’s. Truly, campaigns leave absolutely zero time for anything other than campaigning. Well, unless that time is after midnight and involves vast quantities of red wine and/or Jack Daniels. This salad is based on an actual Applebee’s menu item, which I’ve never had and don’t ever intend to. So this isn’t precisely a copycat recipe. I just used the description on their website to come up with something that might somewhat resemble what Michael orders in that pivotal scene. Though honestly, I have to wonder what Applebee’s is thinking here. The original menu item purports to have “chimichurri-glazed chicken” which does make any sense to me because chimichurri is an Argentinian condiment comprised mainly of olive oil and parsley. How you make a “glaze” out of oil was impenetrable to me. So instead I basically made broiled southwestern style chicken slices and topped the whole thing off with black bean and corn salsa, a bit of cheddar cheese and used the chimichurri as a dressing. It makes more than you’ll need, but is traditionally used on any kind of grilled or roasted fish, fowl or meat. So you can use it to dress up a simple dish later in the week if you end up with extra. Finally, I’ve called for crumbled tortilla chips here to add a little bit of extra crunch as a garnish. I actually went ahead and deep-fried five thinly-sliced corn tortillas in about two cups of vegetable oil in a small saucepan, but frankly, that’s a lot of effort and mess for a topping. So you could do that or you could take the easier route (which admittedly didn’t occur to me until after I’d eaten the salad) and just do the crumbled chip thing. I might be a complete snob when it comes to Applebee’s, but hopefully I’m not totally unreasonable. 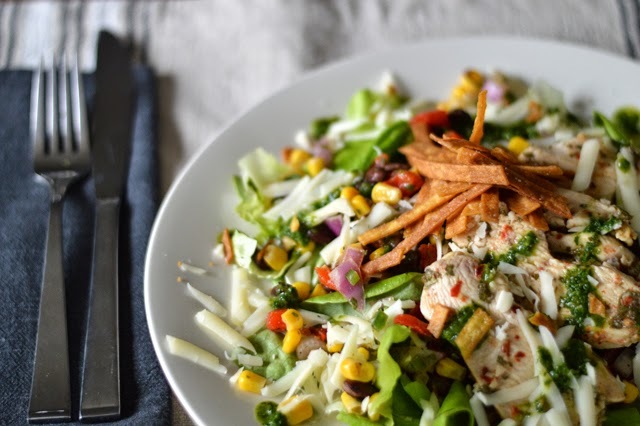 An Applebee’s copy-cat recipe for a jazzy chicken salad. 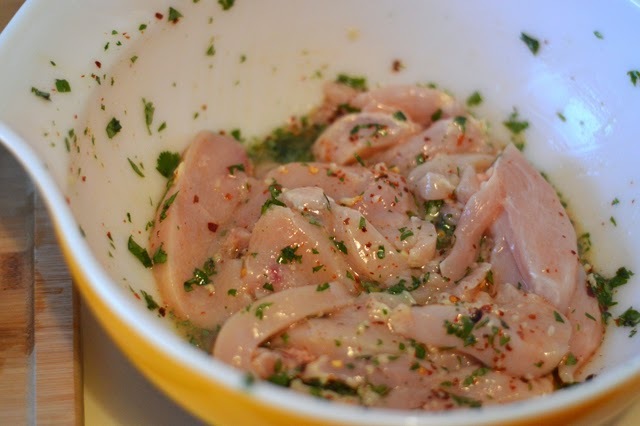 Combine marinade ingredients in a medium bowl. Cover and refrigerate for 1 hour. 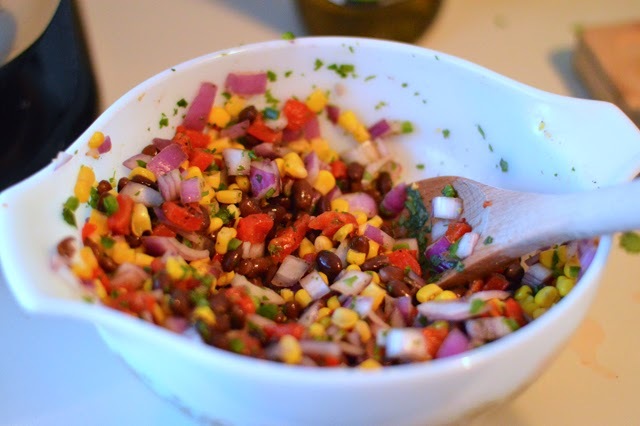 Combine salsa ingredients in a medium bowl and set aside. I started with 1/2 teaspoon salt and 1/2 teaspoon black pepper. It’s pretty flavorful already so it doesn’t need much. Adjust oven rack to top third of the oven and preheat the broiler. 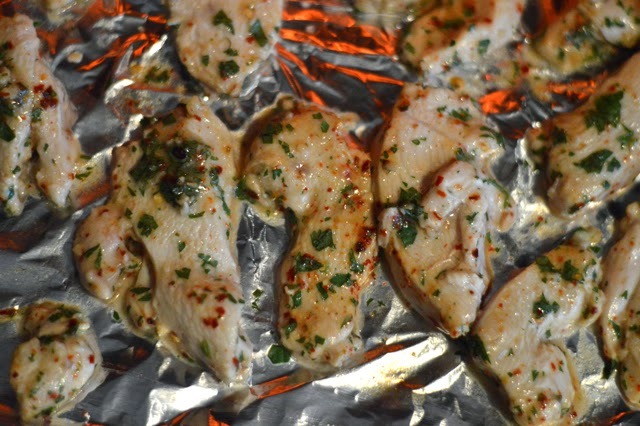 Cover a cookie tray in aluminum foil and arrange marinated chicken slices in a single layer. Broil for 5 minutes, flip using tongs and broil for an additional 3 minutes. Add dressing ingredients to a food processor or blender (minus the lettuce, cheese & tortilla chips) and mix until combined. Tear lettuce into pieces and distribute among four plates. Top with 1/2 cup salsa, 1 ounce shredded cheese, 1/4 of the chicken, a few crumbled tortilla chips and about a tablespoon of the dressing. All ingredients can be made up to a day ahead and refrigerated. This chicken is just as good cold as it is hot. 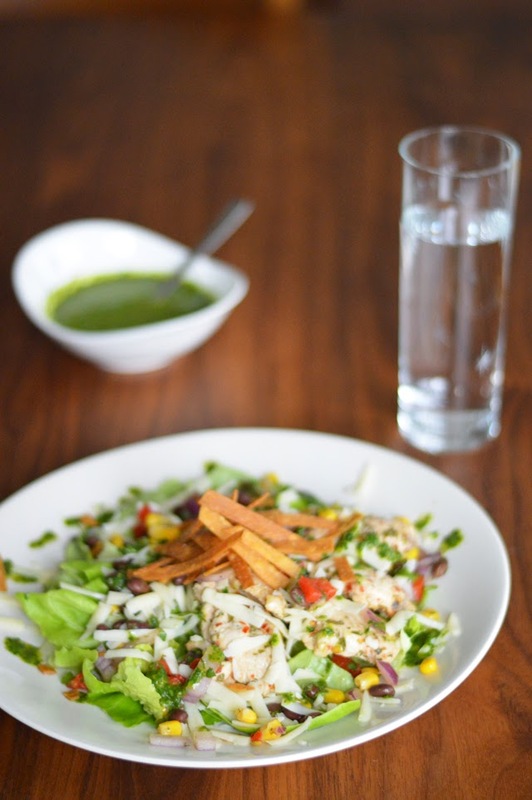 A lot of the time involved in this recipe is in the marinade so it’s pretty quick if you prep the marinade before work and assemble the salad when you’re ready to eat! Disclosure: I received Party Lines from the author for review purposes. We also converse frequently via email and Twitter.